Pendulums are often used as tools for spiritual healing and inner growth, and also used for measuring levels of energy and detecting imbalances in the chakras and human energy fields. Personally, I use a pendulum when doing energy work on myself and others, to read energy fields and Chakras. 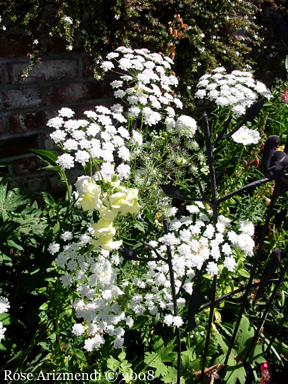 I also use it to determine what herbal preparations, supplements, vitamins, homeopathics or flower essences are best for me to use. 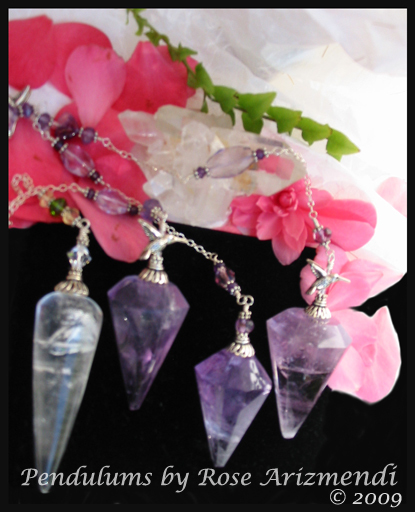 Pendulums can also be extremely effective for distant healing, and for clearing houses of unwanted energies. To use a pendulum, all you need to do is simply hold the intention that the pendulum is a healing tool, and understand on a very deep level that we are all one, there’s no separation. We are divine and we are all infinitely powerful. Today we are having some work done in our yard and all the noise has been upsetting our dog. Several years ago, our Vet suggested we try a couple of drops of Rescue Remedy in his water when he experiences bouts of extreme anxiety, so I added two drops to his water and after several minutes he finally settled down. Crystal singing bowls are one of the most powerful tools for relaxing the body and mind. Like many forms of alternative vibrational healing, such as Reiki, flower essences, and crystals, the singing bowls help to dissolve energetic blockages in our chakras, allowing our body to return to it’s natural state of balance. 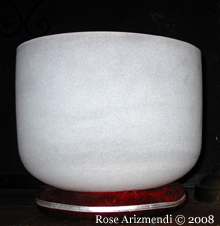 I received my first crystal singing bowl in the late 90’s, during a time in my my life where I found myself feeling particularly tired and exhausted. One day during my lunch break I visited a shop where they had a beautiful sanctuary set up with all kinds of crystal bowls, water fountains, and statuary. As I was admiring the crystal bowls, the owner offered to play them for me. We then sat on floor cushions and she began playing the bowls. I felt my whole body begin vibrating, and when she had finished I felt completely relaxed, renewed, and invigorated. It was such a wonderful experience! Later, when I brought my first bowl home I placed it in my meditation room and began exploring several ways of working with it. I started using aromatherapy by rubbing the rim with essential oil and as I played the bowl the fragrance was released into the air. Heavenly! Inspired by Dr. Masaru Emoto’s book “Messages From Water”, I started making flower essences using my crystal bowl and was amazed as I watched the flower essence water dance, creating patterns as I played the bowl. Over the years, I have collected both Crystal and Tibetan Singing bowls, and they have become part of my own spiritual healing journey. I took my time selecting my bowls and sometimes years passed before I bought my next one. The journey has been slow but very rewarding. Here is a site which may help you wade through all the debate and stories surrounding singing bowls.